Any new guest house Ecully / Dardilly the heart of Techlid opposite the Bois de Serres, 10 minutes from Lyon. Decoration, one theme per room: Studio Lille, Bohemia Room, Chalet, or Mogador Rétaise ... Change of scenery! 20-meter pool, and cooking facilities. 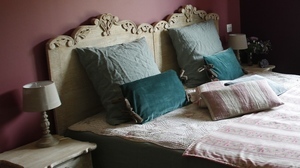 Rooms with terrace or balcony, Italian showers or baths, beds 160cm, Wifi available, tea corner in every room. You're Way RafourAt number 165, right, beige and red house below "
You're Way Rafour at number 165, right, beige and red house down. "